Lupin is annoyed at having to go see Rebecca, just to sign divorce papers. Rebecca is depressed that Lupin doesn’t want to be with her. A zombie emerges from the water and comes onto the deck to attack. 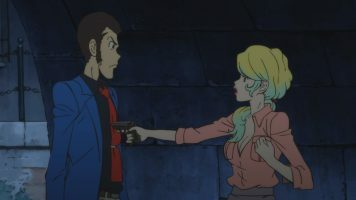 Rebecca grabs Lupin’s gun after he’s hit with a bottle. She shoots the zombie, but to no avail. More zombies emerge, so the couple flee indoors, where a new broadcast is telling of a mysterious virus sweeping through Venice. Lupin can’t believe it, but then zombies attack the newsreader on TV. 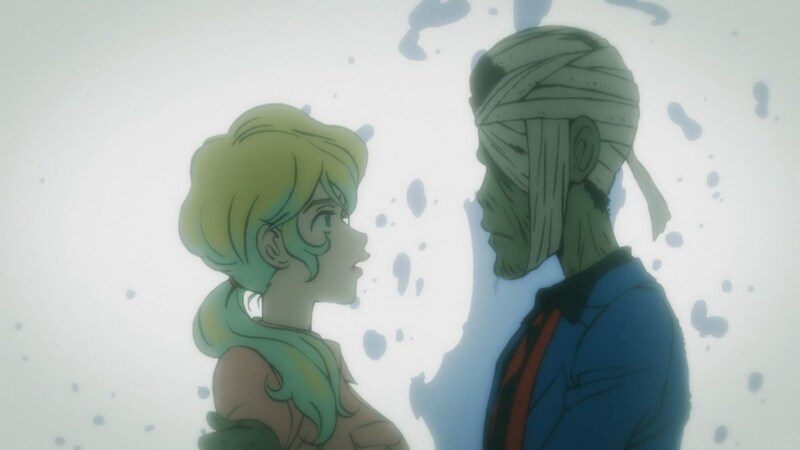 Lupin and Rebecca attempt to flee to her yacht, but it is filled with zombies. They are forced to run to a tree on a cliff overlooking the sea. Lupin decides their only means of escape is to make the jump to the water. Rebecca gets Lupin to agree to hold off on their divorce, if they survive. Before they can just, three helicopters show up and rescue them. 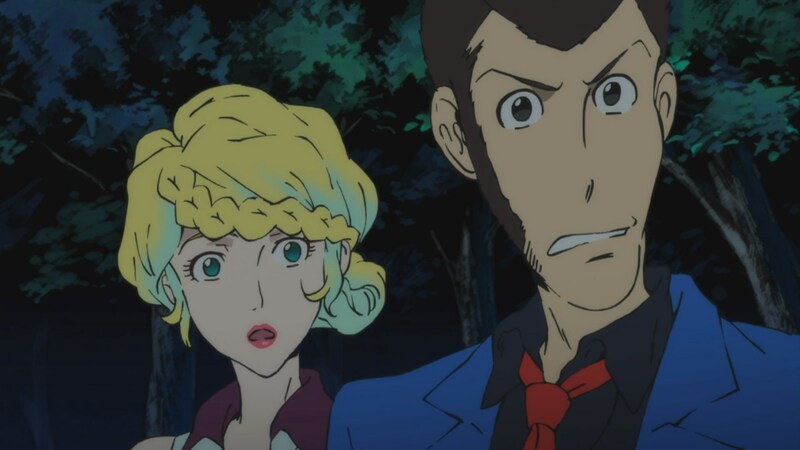 However, when they land on a cruise ship, Lupin discovers this is actually a movie that’s being filmed and produced by Rebecca. 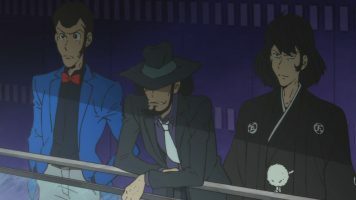 Sometime later, Jigen and Goemon watch Rebecca to a press conference about the film and are amused at how Lupin was fooled. Lupin is determined to get revenge on Ami, but he can’t get Goemon and Jigen to help him. Lupin goes to steal the film, only to discover Rebecca beat him to the punch. He catches her on a gondola, but then the Italian police use an attack helicopter to attack blast them. They flee, but Lupin knows this is another scene in Rebecca’s movie. Rebecca confesses, after having been busted, finding the whole moment of a wife fleeing with her husband to be romantic. Lupin is ready to toss the other film into the water, but Rebecca makes a deal with him. 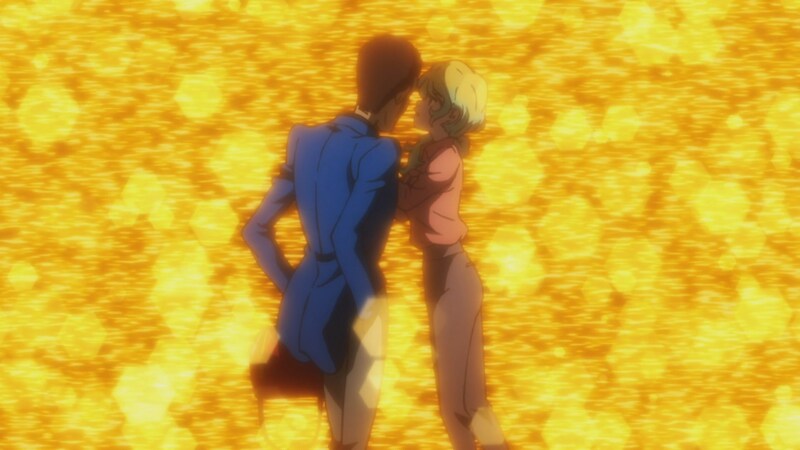 Lupin realizes that Rebecca has been playing him all along and so he agrees to her terms. 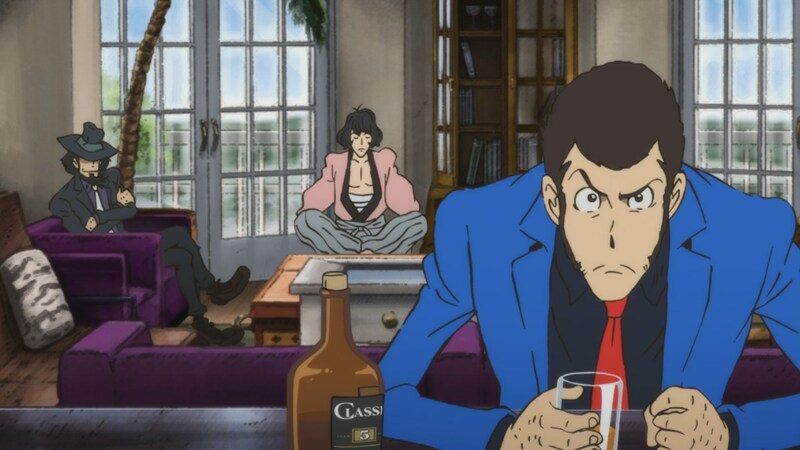 When the film debuts, Lupin, Goemon, and Jigen go to see it. 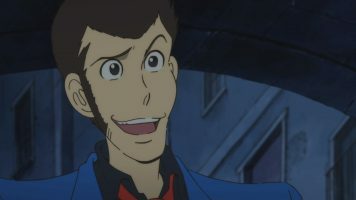 Lupin has been digitally made to look like a zombie, howbeit one who still retains his humanity. Jigen remarks that Lupin could make his marriage to Rebecca real. Lupin decides Mrs. Lupin is too much for him. 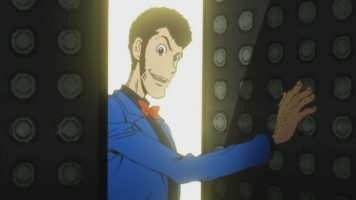 When Lupin the Third Part 4 – OVA 1 aired in Italy, this was the sixth broadcast episode. 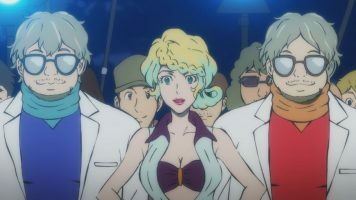 However, when the series finally aired in Japan, TMS followed standard Japanese operating procedures and placed the episode behind a Blu-ray pay wall. After all, gotta fleece those fat, otaku bastards for every yen they are worth! Thankfully, we in America got to see it on Crunchyroll, though as episode 25. ? 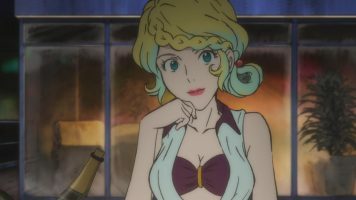 It has been a while since I watched Lupin III Part 4, but Rebecca was one of my favorite elements to come from the series. Like Lupin, Rebecca didn’t need to steal to make a living. She did it for the challenge and thrill. While she may not have been quite as good as Lupin in thieving, she was more than a match for him in other areas. 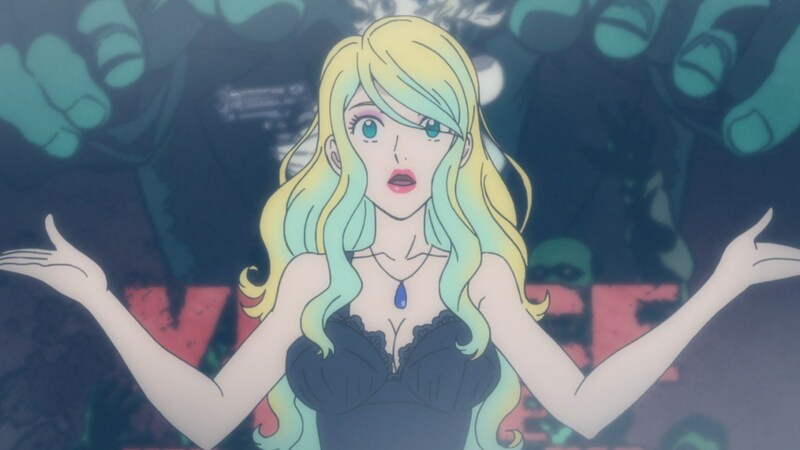 Lupin the Third Part 4 – OVA 1 showed this aspect of Rebecca and why she’s so awesome. She understands Lupin completely. Thus she was able to lure him out with her promise of signing the divorce papers. Then she was able to completely fool him into thinking the zombie apocalypse had happened. 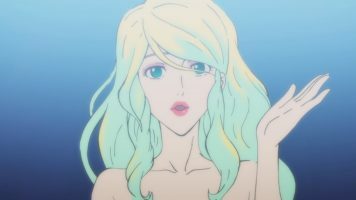 And even though Lupin expected her to attempt to con him again, she still managed to get him to do what she wanted and be in her film. This is why I want to see her in a potential Part 6 TV series. She can easily keep up with Lupin, no matter what the situation. And when needed, she knows how to play him like a fiddle. In many ways, she is Lupin’s perfect wife. 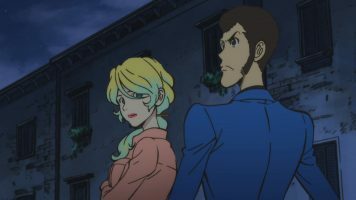 For the Lupin III Part 5 series, Lupin’s romantic interest is only Fujiko, and it is strained at best. I like to think that part of Fujiko’s issues with Lupin in that series actually stem from Rebecca. To be honest, I think that if Fujiko weren’t in the picture, Lupin would make Rebecca his #1 girl. Lupin knows that Rebecca can play him. Despite this, he is unable to stop dancing to Rebecca’s tune. And in many ways, Rebecca is better at making Lupin jump than Fujiko is. After all, Lupin jumps for Fujiko because he does love her more than any other woman. Lupin doesn’t want to jump for Rebecca, but ends up doing it in spite of himself. I like how at the end of the episode, Rebecca is on stage, but blows him a kiss. 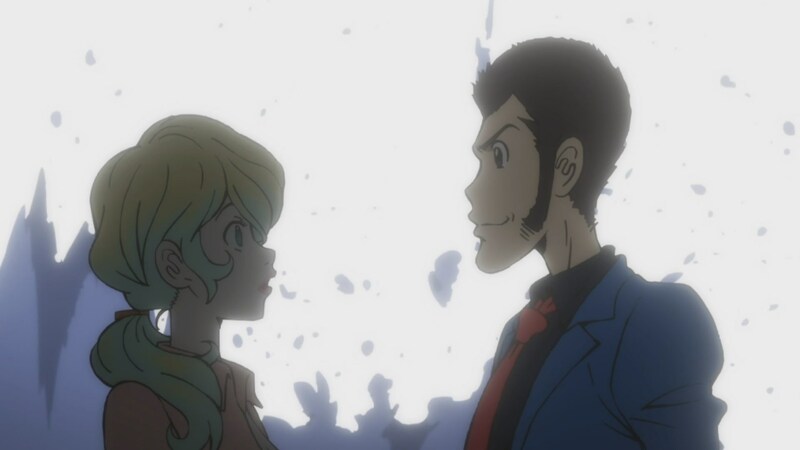 Lupin acknowledges her as Mrs. Lupin-chan. At that moment, she has earned Lupin’s total respect and even trust. A Publicity Hound Thief Doesn’t Want Fame? The one part about the episode that didn’t ring true was Lupin’s unwillingness to be seen on film. Lupin is an infamous thief. He loves showboating. He even sends cards to folks, letting them know in advance that he’s going to rob them. He’s been seen on TV before and certainly law enforcement agencies all over the world have his pictures on file. Indeed, in the Lupin III Part 5 series, we learned that there are a lot of things from Lupin’s escapades that have been recorded on video/film somehow. So when he tells Rebecca that he doesn’t want the fame of her movie because he’s a thief who keeps hidden from the world, I call bull! He’s done a very poor job of keeping hidden from the world thus far. The only point I will concede is that Rebecca’s film would end up making him more widely known than he already is. But even that wouldn’t really hamper Lupin from doing what he does best. 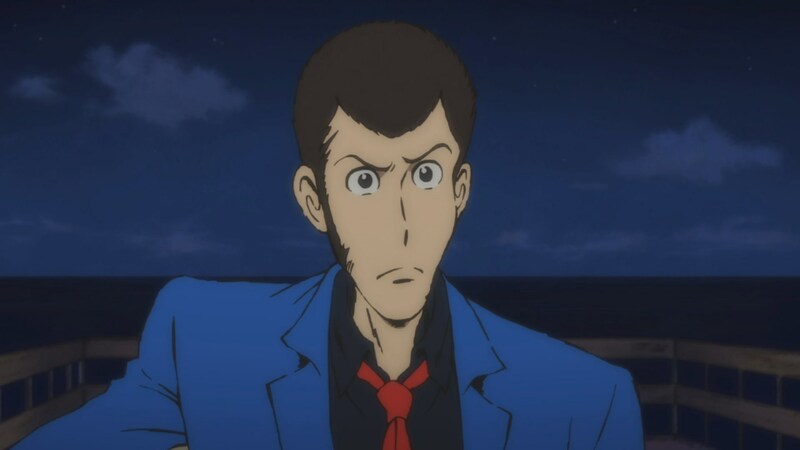 OK, time for me to wrap up my review of Lupin the Third Part 4 – OVA 1. Neither Fujiko nor Zenigata were in the episode. Its a bummer, but understandable. Jigen and Goemon scored very little screen time. But it was mostly used to tease Lupin, which was fun. Plus, we got to see them and Lupin dress up for the movie premiere. In the end, Lupin the Third Part 4 – OVA 1 was a very enjoyable episode, showing once again why Rebecca was such an awesome addition to the franchise. I never cared for the main story of part 4 but I did enjoy the self contained episodes. Well, the end of the main story did get pretty surreal. ? I don’t mind surrealism but there was a poor segue from the pulp to the science fiction. Da Vinci just comes out of nowhere with his silly Bondian scheme.